Abra Therapeutics needed a Storefront to sell their products. 1 Call Service setup a shopping cart system that allowed them to have customer groups, take credit cards online and also integrate with Quickbooks Merchant Services. Smokie’s BBQ is a BBQ delivery service operating in Texas. 1 Call Service designed and setup a custom Content Management System (CMS) for BBQ Delivery.com, allowing “Smokie” to easily maintain his own website, without the hassle of having to have a dedicated website developer on his staff. 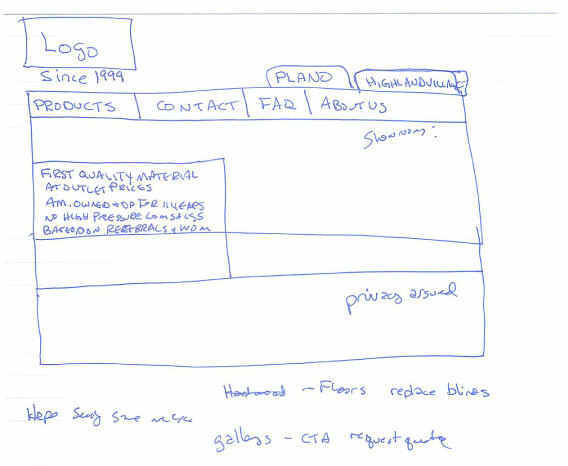 The design was based off of communication and meetings between BBQ Delivery.com and 1 Call Service. There have been vast improvements on the part of Google maps to allow full integration into a website. These links not only take you off of the site (although they do open in a new window instead of replacing the current one), one of the links is misspelled, which causes Yahoo! Maps to throw an error. Site was originally viewed in Mozilla Firefox. Upon viewing in Internet Explorer, the site renders as it should. However, when designing a website, one should always design so it renders correctly in ALL browsers. The width of the center section is just slightly larger than the top and bottom. 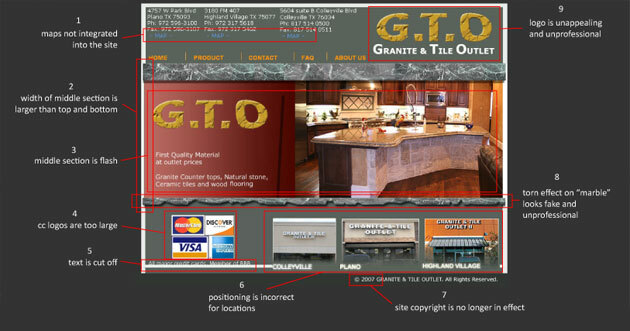 This is already pronounced due to the granite borders, but then the eye is given an uncomfortable feeling, since it always tries to match up lines and in this case, it cannot. This site says copyright 2007. To the casual web visitor, this tells them "Hey, I haven’t updated this site since 2007, so all of this information is probably old, and I may not even be in business any longer." It doesn’t assure them. If the company can’t keep their website fresh and updated, what does that say about the company as a whole? When designing in flash, you lose accessibility. The main content is here, so there is no way for Search Engines to tag and catalog this information. Also, the logo of is repeated in such a close proximity to the logo at the top, causing the page to become unbalanced and uncomfortable to look at. This design element has the granite all cut up and jagged. It looks fake and also goes against the professionalism the company is trying to show in the image gallery. Most companies on the web today accept credit cards. The credit card logos are too large and draw attention from the other aspects of the site. In the case of this site, just mentioning in text that all credit cards are accepted would be sufficient There is nothing memorable about this logo and it looks to have been put together at the last minute. In keeping with the "initials" theme, there should be a period after the "O". This logo, like the torn effect, goes against the professional look that the company wants to convey. 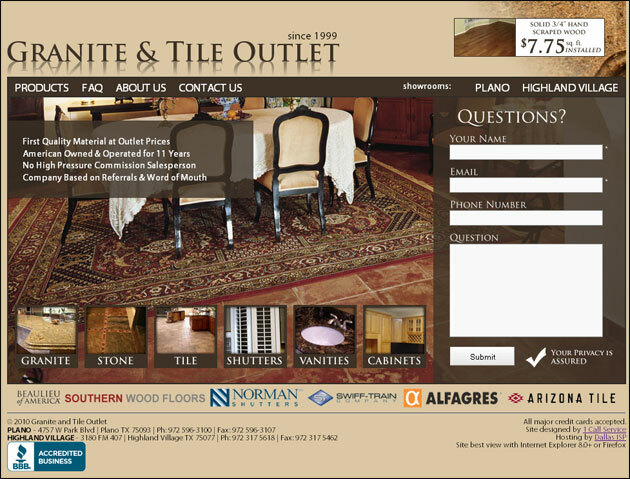 In addition to the design layout of the site, we also assisted Granite and Tile Outlet with their Search Engine Optimization efforts. Custom programming for the NBC Behavorial Screening checklist used by school districts everywhere. 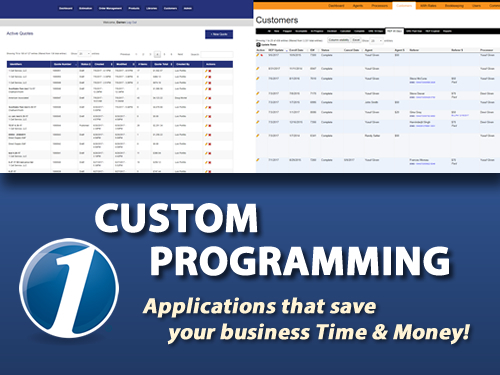 1 Call Service was asked to create a web based application to enable fast access for schools and teachers. The application now allows new school districts to be added where teachers quickly complete student screenings to work with the parents and school staff to insure the best outcome for students. This replaced a time consuming paper process involving faxes and emails. iPhone developers release Countdown to 2012 utility application on the Apple App Store. DALLAS, Texas–November 13, 2009 As the 2012 movie comes out there is a Countdown to 2012 application released in the Apple App Store that will count down to the December 21, 2012 predicted end of the world but also has the benefit of users being able to create custom countdown items. Countdown to 2012 is a personal events countdown application with an eye towards fun. Users can create personal countdown items and even have the count go up after the event. For example. 125 days until your wedding day then the counter can count up showing how many days since your wedding! This is a fun feature for a practical utility! Got a traffic ticket, and want to know how many days until court? Create a personal countdown. The contract developers, 1 Call Service, stated they are happy to be part of the family of over 100,000 applications now available on the App Store. 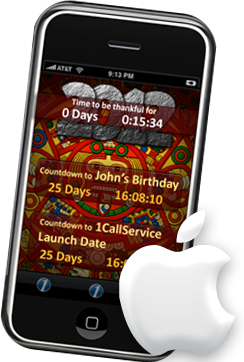 Visit iTunes App Store on your MAC, PC, iPhone or iPod Touch to purchase Countdown to 2012 or 100,000 other apps. The iPhone has transcended the line of being just a phone and is a universal platform that has truly become a personal digital assistant. Apple ignited the personal computer revolution in the 1970s with the Apple II and reinvented the personal computer in the 1980s with the Macintosh. Today, Apple continues to lead the industry in innovation with its award-winning computers, OS X operating system and iLife and professional applications. Apple is also spearheading the digital media revolution with its iPod portable music and video players and iTunes online store, and has dominated the mobile phone market with its revolutionary iPhone.